Brent Hecht is an assistant professor in the School of Communication with a courtesy appointment in the Department of Electrical Engineering & Computer Science in the McCormick School of Engineering and Applied Science. Formerly an assistant professor of computer science and engineering at the University of Minnesota, Hecht explores the intersection of human–computer interaction, geography, and big data. 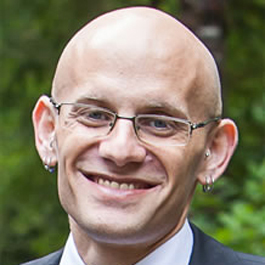 Hecht has been a keynote and featured speaker at a number of events worldwide and has won awards for his research at top-tier publication venues in human-computer interaction and geography. He collaborated with Google Research, Xerox PARC, and Microsoft Research, and his work has been featured by The New York Times, The Wall Street Journal, The Los Angeles Times, NPR, ABC News, Time Magazine, Süddeutsche Zeitung, Bild, El País, Le Monde, and various other international TV, radio, and Internet outlets.